Memorial erected as a tribute to the staff who manned the East-West Telegrah service between 1877 and 1927. 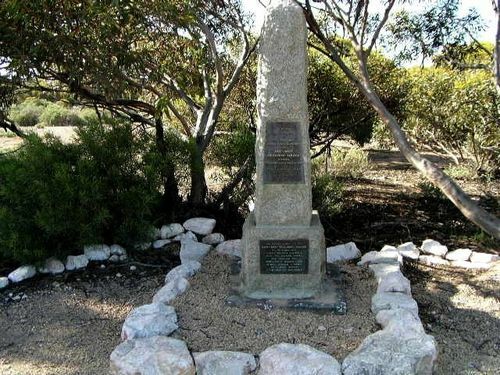 The memorial also contains a plaque commemorating the construction of the South Australian portion of the East-West Telegraph Line between 1875 and 1877. To build the East-West telegraph Line supplies were dropped off at the nearby Eucla Jetty. Then the Post and Telegraph crews began the job of scaling the nearby sand-hills before following the route taken by explorer Edward John Eyre along the tops of the Bunda Cliffs and across the Nullarbor Plain. In South Australia, workers unloaded supplies at Fowlers Bay and began constructing their own telegraph station before branching out West. The West Australians used jarrah while the South Australians opted for tubular metal telegraph poles and at 4pm on the 8th of December 1877, the first telegraphic message flashed across the Nullarbor. Eucla Telegraph Station was the largest station on the 1877 East-West Telegraph line, and acted as a transfer point of telegraphic messages between South Australia and Western Australia from 1896 to 1905, when the operations were amalgamated under the Western Australian Post and Telegraph Department. Between December 1877 & March 1927. East-West Telegraph Line 1875 - 1877. Commenced At Port Augusta On 25 August 1875. Adelaide And Perth At 4.00pm On 6 December 1877.